Winter roof damage can get you down. Humans are not the only ones who become blue in the winter, your roof can too. The pressure of the hard, cold days and nights, piling up on top of it, as well as the wind blowing across every shingle. No wonder your roof responds poorly. Here are some of the signs that your roof has the winter blues, and could use a little love from the folks at High Quality Contracting Inc. When the heat from your home reaches the cold service of the roof it results in condensation. The condensation moistens the existing insulation and wood causing mold and mildew to grow resulting in the interior structure of your home being damaged. To check for this you can go into. your attack space and look for moisture, wet marks, and mold. To prevent this from happening you must eliminate the amount of air leakage into your attic as well as improve the insulation & ventilation which will allow moist air to escape the roof. 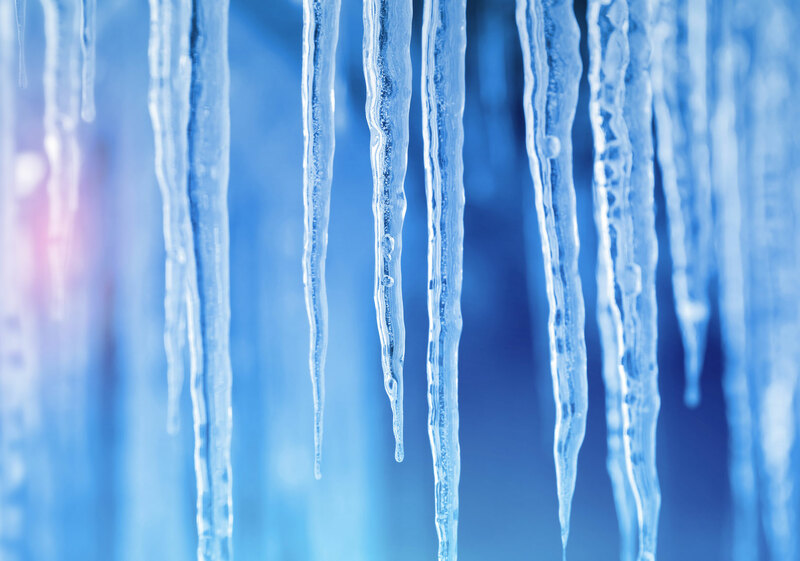 Although those icicles are beautiful to look at, they are dangerous, furthermore, they are a sign that your roof may have a problem. Icicles are the result from heat melting the snow on your roof and then the water forming around the gutter system. 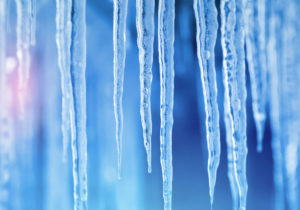 The problem with icicles is that they are dangerous and can fall on someone or damage property, as well as, the weight from several well-formed icicles is daunting on the structure of your roof and existing gutter system. To prevent icicles from forming, clean out gutters during the fall, and sweep the snow off your roof and from your gutters. The most dangerous of winter roof hazards are ic dams. These nasty structures form when the snow melts on the warm roof, resulting in the accumulation of ice and water on the roof and under the shingles. The fact is that an ice dam does not need to be thick to cause a problem. They can be as thin as one inch and severely damage the integrity of your roof. They can become very heavy and often result in roofing leaks and damage. Most often by the time you find the leak inside of your home, the damage has been there quite a while because often the water from the ice dam pushes into the home and travels around the wall and ceiling cavities until it finds an escape. So what do you do if you think you have an ice dam situation? Winter roof damage gets worse the longer the damage is not taken care of. We would strongly suggest contacting a licensed and insured roofing specialist like High Quality Contracting, Inc. We will investigate the problem and develop a solution based on your specific home structure and needs. It is not always an insulation problem that needs to be addressed, sometimes, missing shingles, air leaks in gaps, or aging roofing is the cause. Remember as the winter cold hits your face, it is also hitting your home. Keep your home happy this winter and chase the winter blues away by keeping your roof strong and sound. Now that Fall is near, homeowners need to start thinking about preparing their roof for winter. A lot can happen over the spring and summer months with weather damaging and rot, so it is best to get a full roof inspection done as soon as possible to avoid costly damage and repairs later on. If your roof is found to be damaged, there are many ways High Quality Contracting can address the situation. We can repair or replace your roof prior to the winter snow heading your way. Your roof is what keeps your home safe from the elements. If it is damaged or leaking, winter snow and cold air can enter your home and your heat will go right out the roof top. You can also have dangerous ice damns build up from insulation issues. Before you head into the holidays, and then catch that draft, schedule a roof inspection today with High Quality Contracting Inc. We are licensed and insured with several decades of experience not only working on roofs, but remodeling and building homes. Call us today for any home project you need! What is Ice Damming and how does it affect my roof? Perhaps you have heard the term “Ice Dam” or “Ice Damming” and are not sure what exactly that is or how it affects your home. We have the answers for you. An ice dam refers to a rim of ice that forms at the edges of your room and gutter systems that prevent water and melting snow to run off the roof (drain) properly. The water backs up and can cause damage to the roof, interior walls, insulation, ceiling, around windows as well as other areas. Ice dams can also be dangerous as when they break loose, sharp ice and icicles can fall to the ground potentially harming people or pets. Mold and mildew problems caused by ice dams. Not only does an ice dam cause damage to your home but it can also cause a health hazard with mold and mildew growth. The moisture and water leaking into the house will soak into the walls, insulation, and drywall. When this happens long enough, mold spores and mildew begin to grow. 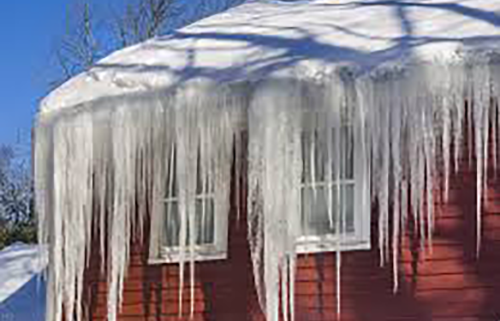 Ice dams are formed when the higher portions of the roof are above 32°F while lower surfaces are below 32°F. The water at the more moderate portion freezes and the more elevated portion runs down to the lower portion backing up behind the ridge adding to the ice dam. How does the roof maintain two different temperatures? Heat rises. When the heat rises if the insulation on the inside of the attack space or in a variety of roofing areas is not sealed properly the top of the roof will become warmer than the edges of the roof. The heat loss also prevents the home from heating fulling and increases home energy costs. How do you prevent ice damming? To prevent ice dams from forming it is important to check the insulation levels in your attic as well as make sure that your roof, soffits, and vents are all sealed properly. It is also essential to make sure that your gutters are free of debris and corrosion as this can cause the water from draining correctly. Roof shingles should be well maintained and lose shingles and rotting boards replaced. Flashing around the chimney should be sealed well. How do I clear an ice dam that is already formed? Safety is critical in this area as that when you are removing an ice dam, you can quickly be hit with massive clumps of ice that roll off the roof. A roof rake is preferred if you have one or to call an expert to remove the ice dam to prevent further damage or injury. What is the best type of insulation to use in my attic to help prevent ice dams? Every home is different as to what kind of insulation works the best for your particular home. Homes with angled ceilings and no attic, roofs with skylights, flat roof dormers and low-slope roofs are especially challenging to vent at a proper level to prevent the ice dams from forming. To understand which options are best for your home it is best to ask an expert such as High Quality Contracting to review your situation. If you would like to schedule an appointment to review your ice damming problem, please contact us here. https://www.highqualitycontractinginc.com/wp-content/uploads/2018/01/icedam.png 375 500 admin https://www.highqualitycontractinginc.com/wp-content/uploads/2017/11/HQC_logo-300x96.png admin2018-01-02 17:35:402018-01-22 11:34:54What is Ice Damming and how does it affect my roof?